This is the online edition of the Western New York Travel Guide published by Clarion Publications of Geneseo, Livingston County N.Y. It covers the 17 county area of Western New York, especially Rochester, the Genesee Valley and the Western Finger Lakes. WNY is approximately the size of Massachussetts and Connecticut combined. For purposes of this guide, we have broken Western New York up into 6 regions. Our map is the best place to start your tour. This area was called the "Western Door" by the Seneca Indians who inhabited WNY before the coming of the Europeans. They were the westernmost of the five nations of the Iroquois Confederation, thus the "Keepers of the Western Door"
We have a Table of Contents and a search feature if you're looking for something in particular. Western New York is a land of great scenic beauty. Most of the dominant features including the Finger Lakes, the spectactular waterfalls, gorges and glens were sculpted by the unique geology of the glaciers. One of the best places to enjoy this beauty is Letchworth State Park, "The Grand Canyon of the East. "The many lakes, including the surrounding Great Lakes of Ontario and Erie make Western New York a water wonderland. Those same geological forces also created a land of great agricultural potential. The Genesee Country, once "The Granary of the Nation," is still a highly productive farm area. There are many agricultural attractions . The region also has a colorful history. The earliest Western New Yorkers were believed to be the Clovis people around 10,000 B.C. In the 1600s, European explorers, missionaries and traders began to visit the area. Contact with the White Man's diseases and military methods was devastating to the Iroquois peoples. Following the defeat of the British and their Iroquois allies in the Revolutionary War, settlement of the region proceeded rapidly. Opening of the Erie Canal in 1825 was a boon to business and emigration. In the 1800s waves of religous fervor swept through the pioneer settlements, thus earning the region the title of the burned over district. Western New York was subsequently swept by a social convulsion. Abolition sentiment and support for the Underground Railroad ran high. The modern Womens' Movement was born in tiny Seneca Falls. In the modern era, the region has become a center for high tech industry. The innovations that George Eastman brought to the photgraphic business with the Kodak plateless camera, started Rochester on its way to its current status as "The World's Image Centre." 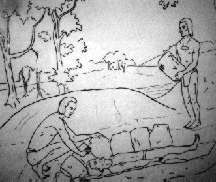 The culture of the mound builders, based in the Ohio Valley, was known to have spread to the Hopewell Indians of Western New York around 300 A.D. This artist's conception of an early burial mound is part of the Western Door Exhibit at the Rochester Museum and Science Center. The 2003 WNY Travel Guide was the last print version of our travel guide. It also included our popular Erie Canal Travel Guide. Genesee Country: The Magazine of Western New York is no longer being published. However, we have limited supplies of the 32 back issues published from 1993-2001. Order by calling 800-346-9770.